Miami, Florida (CNN) -- Former Panamanian dictator Manuel Noriega was put on a plane to France on Monday after U.S. Secretary of State Hillary Clinton signed extradition orders. Noriega's extradition came after he spent 20 years in a U.S. federal penitentiary in Miami, Florida. Noriega was convicted in 1992 of cocaine trafficking, racketeering and money laundering. His sentence ended 2½ years ago, and his next destination has been the subject of a court battle. With U.S. marshals by his side and wearing handcuffs, Noriega shuffled his feet as he was escorted to the commercial Air France flight at Miami International Airport. The move came as a shock to the Miami attorneys who have defended Noriega for more than 20 years. "I would have hoped, if an order was signed, that the State Department would have the courtesy to respond to his lawyers and tell them an order was signed," said Frank Rubino, Noriega's criminal defense attorney. "I'm in total shock they did this without the common courtesy of a phone call," he added. 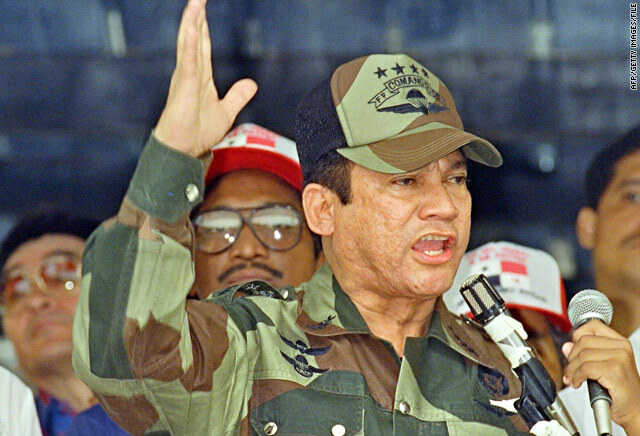 Noriega and his attorneys had argued that the United States was violating the Geneva Conventions by not sending him back to Panama, where he was seized by U.S. troops after the United States invaded Panama in 1989. U.S. federal courts repeatedly ruled against him. His last shot had been an appeal to the U.S. Supreme Court, which in January declined to hear his case. U.S. forces removed the ex-dictator from office during Operation Nifty Package, the 1989 invasion of Panama. Noriega had fled his offices and tried to seek sanctuary in the Vatican Embassy in Panama City. U.S. troops set up large speakers around the compound, blaring music at all hours, a psychological ploy to rattle the general. He surrendered January 3, 1990, and was quickly escorted to the United States for civilian trial. After his drug conviction, Noriega was given POW status. His federal sentence, originally for 30 years, ended in September 2007 after time off for good behavior. In Panama, Noriega is wanted for the murder of a political rival. Panama has requested his extradition, but the U.S. is honoring France's request instead. France has convicted Noriega in absentia of money laundering but has promised him a new trial. While in U.S. custody, Noriega dealt with prostate cancer and had a stroke. Last month, in an exclusive interview with CNN, Noriega's grandson Jean-Manuel Beauchamp said that he had grown to admire his grandfather. He was only 4 months old when the U.S. invaded Panama. "When I was a kid, I didn't grow up knowing he was in prison. I thought he was in school," Beauchamp said. "I've spent quality time with him but not private time," he said, alluding to prison security and the monitoring of conversations. "He's the smartest man I know. He's so friendly, outgoing, knowledgeable. He's always looking to teach or give advice.